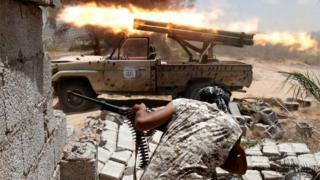 Rival militias are battling one another in Tripoli in the heaviest fighting in the Libyan capital for two years. Medical sources told the BBC that at least eight people, including civilians, have been killed and more than 20 injured. A new UN-backed Government of National Accord (GNA) still lacks authority and the country remains volatile. The French Foreign Ministry said it was "very worried by the escalation of violence". The BBC's North Africa Correspondent, Rana Jawad, in neighbouring Tunis, said two of the city's largest and most heavily armed militias are fighting an alliance of hard-line Islamists and militias loyal to rival political authorities. Libya is still politically divided as rival administrations attempt to assert their power. Clashes are said to be continuing in two main districts in the south of the capital. Tanks and pickup trucks armed with rocket launchers were reportedly deployed in several districts. Witnesses told the BBC that people stayed at home on Friday morning and many businesses stayed closed. The new government in Tripoli has not commented on the clashes. Which are the main militias? Gen Khalifa Haftar, an important and divisive player in Libyan politics, leads the so-called Libyan National Army (LNA), which is made up of former army units and militias loyal to them. He has cast himself as the main opponent of the Islamist militias and has the backing of the Tobruk-based government and is said to have co-ordinated military activities with Egypt and France. The Benghazi Revolutionary Shura Council (BRSC) is an Islamist umbrella group that includes a complex make-up of radical fighters, including those who pledged allegiance to IS. It has members of Ansar al-Sharia, the group that was blamed for the 2012 killing of US Ambassador Christopher Stevens in Benghazi. It may also be linked to the Benghazi Defence Brigades (BDB), a new group formed of Islamist fighters mainly pushed out of Benghazi. They all have found common ground in fighting against Gen Haftar. Islamic State's main base is the city of Sirte and is made up of defectors from local jihadi groups, and foreign fighters. Its most prominent affiliate in Libya was the Islamic Youth Shura Council (IYSC). In October 2014, the IYSC declared that Derna, a small town on the north-eastern coast and some 720km (450 miles) from Tripoli, had become the first Libyan town to join the global caliphate that IS has vowed to create. However, it has since been pushed out of the town bythe al-Qaeda-linked Mujahideen Shura Council of Derna. An umbrella group known as Libya Dawn, which controlled much of the west, including Misrata and Tripoli, has split up into various brigades with differing loyalties. Some of them support the UN-backed unity government, others remain undecided. The group seized Tripoli in August 2014 with the backing of a senior Islamic cleric and was led by fighters from Misrata, the city which took pride in putting up the most fierce resistance against Col Gaddafi's forces. Some of the militias from Misrata make up a large portion of the anti-IS operation in Sirte.